The main two-storey house is designed in a fluid curvilinear formation. It’s a truth universally acknowledged that home is where the heart lies. 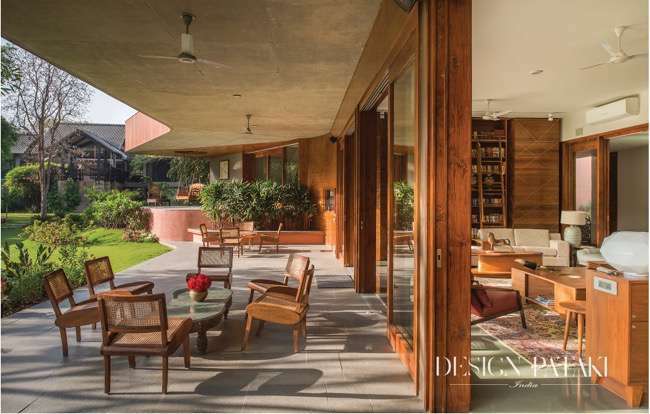 For the Munshaw family, the heart decidedly lays divided – in the legacy of their ancestral home situated in the bustling city of Ahmedabad and in the quiet embrace of nature. A dichotomous design dilemma? Not particularly for architecture firm Modo Designs. 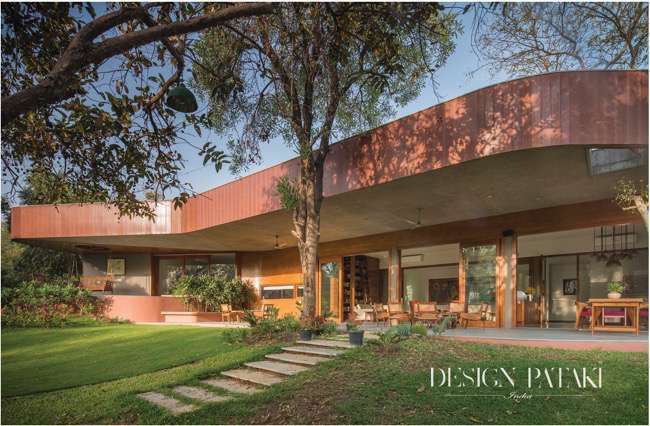 They created for the Munshaws a new residence – The Verandah House, where the family’s distinctly different loves not only dwell together but are seamlessly interlinked for eternity. Design Pataki decided to explore the fascinating design elements that make Verandah House an enviable home in both body and soul. 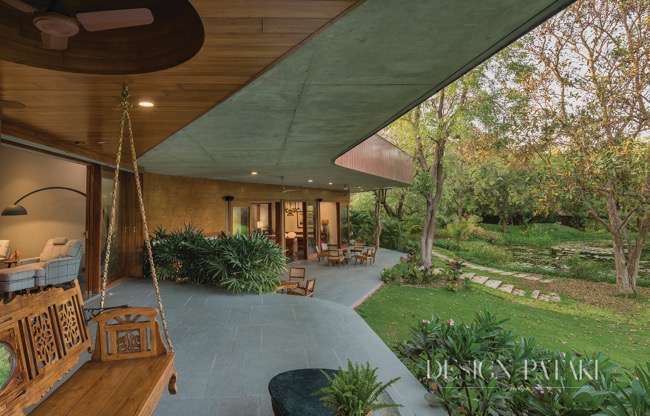 Situated on the outskirts of Ahmedabad, Verandah House is surrounded by four acres of dense flora, a lily pond and an existing outhouse having a distinctively vernacular typology. The main two-storey house is designed in a fluid curvilinear formation as a visual reinterpretation of the family’s ancestral home of colonial design. It bends through its fifteen-feet cantilevered verandahs to allow views of the lily pond and the main garden to the ground floor of the house. This allows a sense of serenity to the central spine of the house which is segregated into the living room, dining room, library and master bedroom all of which lavishly open into these semi-open verandah spaces. The cantilevered verandahs allow views of the lily pond and the main garden. Library used as a Space Divider. The rear bay of the house is interspersed with the landscaped entry court and a central court that allows natural light within the house. While the rear bay of the house consists of the kitchen, the daughter’s bedroom is interspersed with the landscaped entry court and a central court that allows natural light within the house. The interior aesthetics of the house which have been envisioned by design firm PVDRS are a celebration of the surrounding rawness of nature as well as the old-world charm of ancestral design with a contemporary twist. The central spine of the house is illuminated by skylights that act as a contrast to the dark and rough Kotah stone flooring, valsadi wood panelling and doors, concrete ceilings and spaces of terra cotta coloured irregular surfaces. The exterior material palette of the house takes up a modest natural jute palette. Ancestral renovated wood and cane furniture give forgotten legacies and cherished sentiments a permanent place in the house. While customised contemporary pieces along with collectables like artefacts, paintings and Persian rugs make space for the artistic affections of the present residents. The rustic interiors of the house consist of dark and rough Kotah stone flooring, valsadi wood paneling and doors, concrete ceilings. The exterior material palette of the house takes up a modest natural jute palette. Ancestral and customised furniture, artifacts, paintings and Persian rugs make the home a container of art. 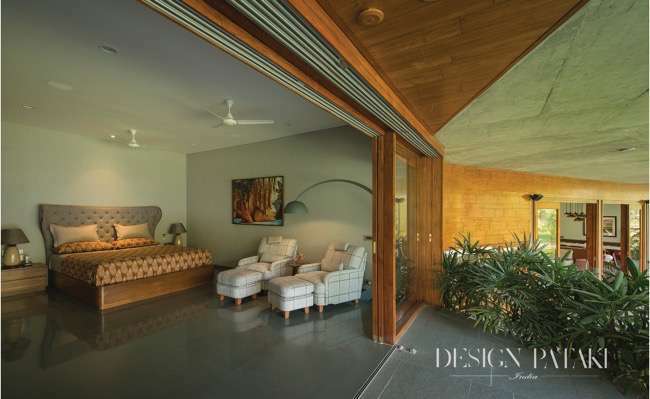 “It was all about responding to the sensibilities of the homeowners – their attachment to the imagery of their ancestral colonial home, their personal outdoor lifestyle and their choice of extending their house as a container for their art collection,” confessed Shah when asked about his design formula for Verandah House.